The purple martin is the largest member of the swallow family. These strong flying, insect-eating birds migrate to North America in the spring, and return to South America in the summer. Martins nest in gourds hanging from vines in treetops or in man-made bird houses mounted on poles. During the spring and early summer, martins rear their young. They catch great numbers of flying insects to feed their rapidly growing offspring, and the martins are feeding young birds at the same time that honey bee colonies are at the height of queen bee production. Soaring high in the sky and performing aerial acrobatics, the martins grab flying insects at will. As martins climb, dive, and sweep through honey bee drone concentration areas 20 to 80 feet in the air, they likely catch some queen bees making mating flights as well as drones. Peace Bee Farm employs drone-breeder colonies with added drone brood frames to increase the number of drones in the drone concentration areas with valued traits. This technique, called drone saturation, is intended to lessen queen matings with feral drones. While some healthy bees are lost to martin predation, I feel like the birds actually help by eliminating weak or slow flying queens and drones. Martins surely apply selective pressure on queen bees while the queens are vulnerable outside the hive. It is evident that martins fly through drone concentration areas, because numbers of drones follow the martins back to their nest. Drones have large eyes to see queen bees making their mating flights. They seem to be attracted to the martins that fly through their drone concentration area. Following a fast moving martin, a plume of drones has no trouble keeping up with the bird as it sweeps through the sky. The drones follow the martins all the way back to their nest. 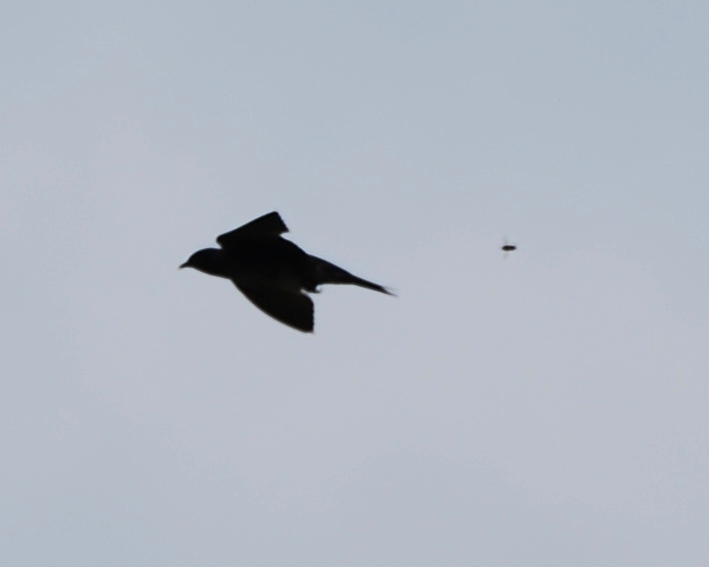 Today’s photo shows a drone in close pursuit of a martin. The birds seem to pay no attention to their “comet tail” of drones. Natural honey bee hives in hollow trees often have multiple entrances. Bees fly in and out of knot holes or broken openings linked to the tree’s cavity. I watched a colony of honey bees in a sweet gum tree for four years. The bees entered the hive through a hole in the tree near the ground. At times, the bees also used a second entrance, a knot hole three feet above and to the side of the tree. The bees would use the upper entrance for awhile, and then seal it with propolis. Eventually, the honey bee colony swarmed and settled into a wood duck nesting box about the size of a deep bee hive body. The duck box had a large entrance hole near the top, facing east. The bees survived a winter in the duck box, and I hived them the next spring as my first managed colony. Honey bees readily use holes in rotted corners of beehives as extra entrances to the hive. The late George Imirie designed shims with openings to give bees an upper hive entrance. 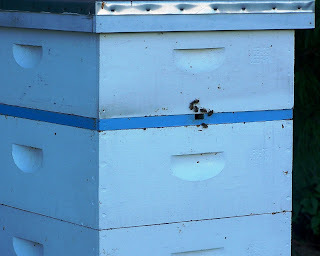 See http://www.tnbeekeepers.org/learning.htm, and then “George Imirie” and “Optimizing Honey Production.” The blue-colored Imirie shim shown in today’s photo allows foraging workers to enter the honey supers without passing through the hive’s brood nest. Imirie felt that using upper entrances with frames of drawn comb increased his honey production. Adding an upper hive entrance also increases ventilation through the hive. Jerry Hayes conducted a small-scale investigation into the effect of upper entrances to bee hives. The report can be viewed at http://www.beesource.com/point-of-view/jerry-hayes/queen-excluder-or-honey-excluder/. Hayes compared three configurations of bee hives: control hives with entrances at the bottom and no queen excluder, hives with entrances at the bottom and a queen excluder, and hives with an upper entrance above a queen excluder. The hives with upper entrances outperformed the other hives in two ways: There was less brood chamber congestion from honey, and more surplus honey was stored in the honey supers. The climate is changing, and conditions are moving toward the extremes. Careful measurements of the earth’s air and oceans are being conducted, and evidence of the change is visible in numerous areas. Some of the results of climate change are quite subtle. This year’s white clover, which secretes nectar heavily between 80 and 90 degrees, produced less than normal nectar as the thermometer quickly surpassed the 90 degree mark. Birds of the tropics ventured farther into more temperate regions. 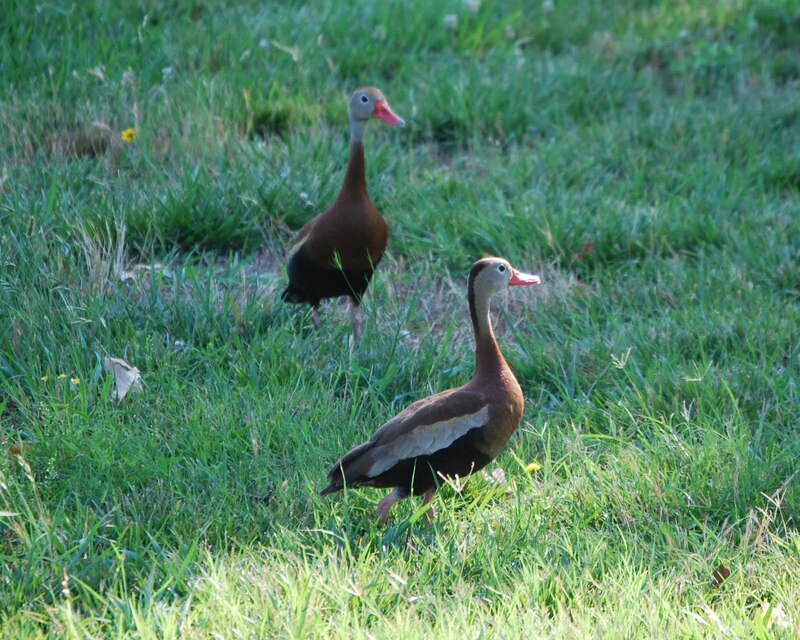 The Arkansas Delta saw birds this summer not typically found in this region. 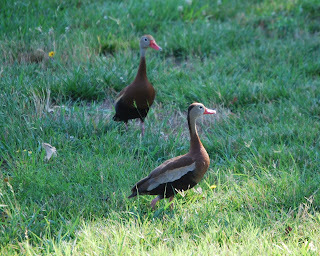 Among rarely seen visitors to the Peace Farm bird sanctuary were a pair of black-bellied whistling ducks, seen in today’s photo. Expanding populations and improved habitat may be responsible for unusual bird sightings; however, warming climate may have an effect as well. One of the most glaring signs of the earth’s climate change is the melting of glaciers. A piece in The New York Times, http://www.nytimes.com/2011/07/17/opinion/sunday/17drought.html, describes the hot and dry weather conditions experienced across America’s southern states. The result has been massive wildfires and water shortages. The Times piece even suggests that portions of the region may become permanently arid, a condition beyond temporary drought conditions. The availability of water is expected to be of increasing concern. Permanent changes in climate will have a significant effect on agriculture and cities. There will be greater demands for water for human use as well as for livestock and irrigation of crops. The changes in climate and available water will affect the quality and amount of forage for honey bees and native pollinators. With a changing environment, the honey bees must adapt in order to survive. The more genetic diversity among the bees, the more likely they will fit in. Today, Tod and I traveled to the University of Tennessee, Martin Campus to help judge the beekeeping and entomology students in Tennessee’s 4-H Roundup competition. The high school students were quite impressive for their knowledge, efforts, and accomplishments. Bee hives are constantly under attack. A healthy hive contains hundreds of pounds of tasty and nutritious food, and is a temptation to numerous animals from insects to bears. The brood and pollen offer protein; and honey is an attractive, high-energy carbohydrate. Throughout the night and day, small hive beetles, moths, wasps, hornets, and yellowjackets, are trying to slip past guard bees watching the hive entrance. At night, possums, raccoons, and skunks test the hive defenses. In their range, black bears are known to tear into bee hives to eat the protein-rich brood. 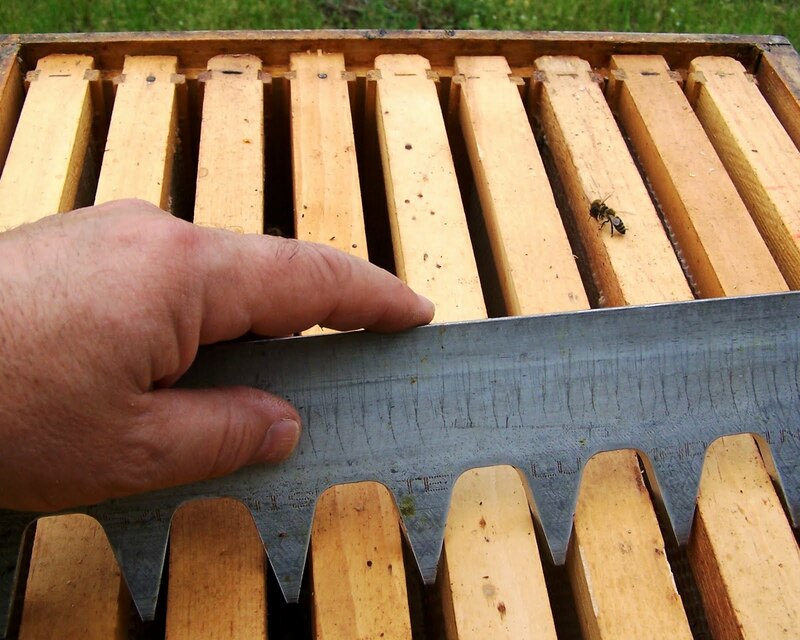 When beekeepers are careless, guard bees find unprotected skin to sting. Probably the bee hive’s greatest intruder, though, is the honey bee from another hive. Bees will rob the unprotected stores of honey from a weak colony. Against all of these invaders the bee hive is protected by workers with well-developed venomous stings. In Kenya, the honey bee is being called upon to protect farms from elephants. These massive animals try to avoid honey bees that sting the sensitive skin around the eyes, behind the ears, and in the nose. A number of large animals are vulnerable to nose stings. Honey bees are known to kill horses when their nasal passages close from numerous bee stings. Following the international blockage of ivory trade, the elephant is making a comeback. With human populations expanding in the same region, deadly encounters between elephants and people are on the rise. Go to http://www.wired.com/wiredscience/2011/07/beehive-fences-block-elephants/ to see how Kenyan top bar hives are being wired into fences to repel elephants from crop fields. The hives, connected by wires, shake violently when elephants invade the fields at night. When the hives are shaken, alerted guard bees fly from the disturbed hives and repel the elephants. 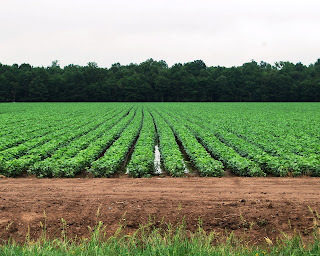 In today’s photo an irrigated soybean field is in bloom in the Arkansas Delta. The soybean, a member of the important bee plant family, the legumes, produces abundant nectar for a light colored and flavored honey. News reports of the loss of honey bee colonies over the past four years have stirred interest in keeping bees. Across America hobbyist beekeepers are placing bee hives in urban and suburban backyards and city rooftops. Some want to help reverse the decline in honey bee colonies. Others want to ensure a supply of bees for their home gardens to grow some of their own food. For many, beekeeping provides an opportunity to look into the complicated life of these intriguing social insects. A recent article in USA Today, http://www.usatoday.com/news/nation/2011-06-27-city-restrictions-beekeeping-fights_n.htm, points to the fact that honey bees are misunderstood, unappreciated, or feared by some. Instead of welcoming honey bees and beekeepers, some municipalities are attempting to keep bees out by passing restrictive ordinances. Those who request banning bees from a community do not realize the unexpected consequences of their actions. While ordinances may ban beekeeping, the laws do nothing to control bees and other stinging insects. Insects simply don’t abide by written laws. Removing managed honey bee colonies from a residential community opens an environmental niche for less desirable insects to fill. Increasing the number of managed bee hives across the country offers benefits. First, more pollinators become available. Many of the new beekeepers are informed stewards of the environment. As they study honey bee biology and the craft of beekeeping, they insist upon using measures that protect the bees and our natural resources. Experienced beekeepers also serve communities by answering numerous requests from the public and governmental agencies for handling honey bee swarm removal and stinging insect emergencies. Beekeepers try to prevent problems with the public by adhering to “good neighbor” practices. They limit exposure of the bees to others by carefully placing hives so that bees won’t fly across areas frequented by people, provide the bees water, and work the bees when conditions are favorable and people are not present. 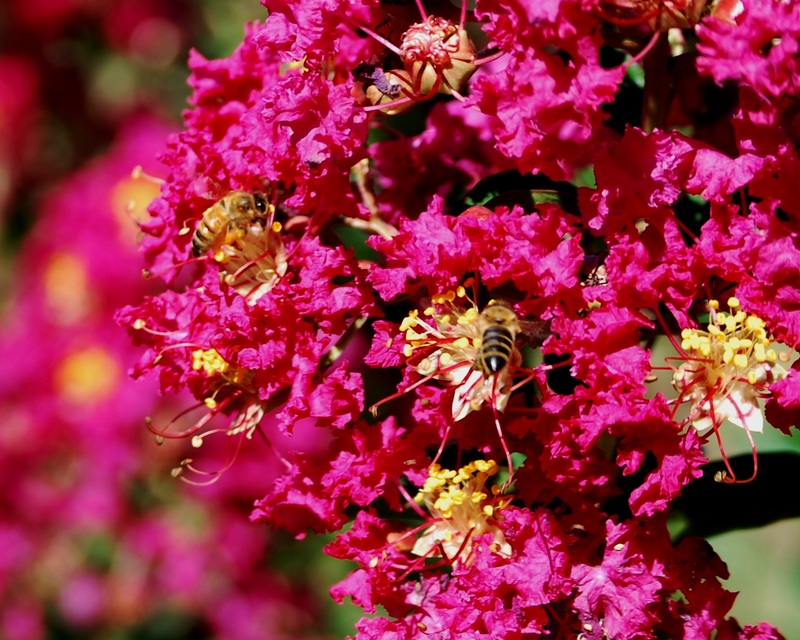 In today’s photo colorful crepe myrtle blossoms attract honey bees to suburban landscapes. Honey bees need our protection. To have healthy honey bee colonies, we want to have a diverse population of drone bees to mate with the queen bees when they make their series of mating flights. A diversity of available genes carried by drones from numerous hives makes for a greater possibility of the queens passing along to their offspring traits that will make them survivable in our constantly changing environment. The queen honey bee’s behavior of mating with a number of drones increases the probability that some of the offspring will be resistant to certain pathogens attacking bees. As important as it is for bees in nature to have a diverse gene pool, there is a time when diversity is not desired: That is when queen breeders are trying to develop new genetic lines. Here, they are attempting to control the mating of the queen to drones carrying particular genetic traits. This inbreeding in a controlled environment is used to concentrate wanted genes in the population. After evaluating the characteristics of the offspring, the best queens are used to produce new queens. This method is being used to produce honey bees with hygienic behavior traits that can live in the presence of parasitic mites and resist a number of honey bee diseases. Lines of hygienic Russian honey bees were developed in isolation on an island in the Gulf of Mexico. A similar tactic is being employed in the Northwest. Honey bees are being bred in isolation in a “sea of wheat” on the Palouse, the immense rolling farmland of Washington, Idaho, and Oregon. 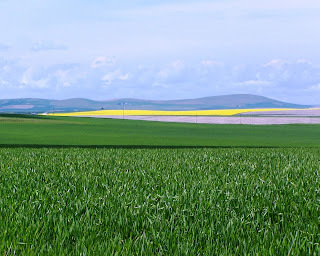 The agricultural region primarily produces wheat, a grass that offers no food to honey bees. 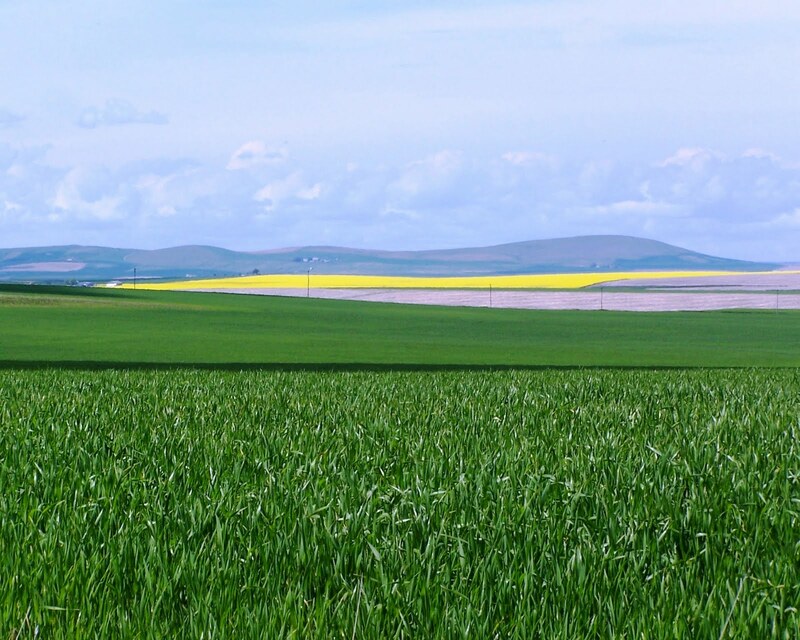 With no food and few nesting cavities in the area, there are no feral honey bee colonies in the Palouse. Queen bees can be naturally mated in flight with drones from desired colonies. The best queens will become new hygienic honey bee lines. Wes Underhill is attending Washington State University, located in the Palouse at Pullman, Washington. A Minnesota beekeeper asks if there are guarantees that the bees one purchases in packages are free of Nosema disease and tracheal mites. The answer is no. There are no visible ways to detect either condition. The pathogen causing Nosema and the mite involved in tracheal mite infestation are both microscopic. To be seen, bees must be dissected and the affected organs viewed under a microscope. At times, tracheal mite infestations lead to “k-wing” bees having unhooked wings and bees crawling along the ground. However, these conditions are not conclusive evidence of tracheal mites. The bees that one receives in a package may carry Nosema disease or tracheal mites, and it is possible that the person supplying the bees may not be aware of the condition. The recently identified strain of Nosema disease, Nosema ceranae, is being studied by scientists of the Managed Pollinator CAP, or Coordinated Agricultural Project. A CAP project for queen breeders, http://www.extension.org/pages/58424/laying-groundwork-for-a-sustainable-market-of-genetically-improved-queens:-the-bee-team, has been started in California. It is designed to help queen producers improve genetic diversity and select for bees that can defend themselves from parasitic mites and diseases. If this program works well, the team plans to establish similar programs in the Southeast and other queen breeding areas. The CAP project also gives an extensive report on the nature of Nosema ceranae at http://www.extension.org/pages/31234/nosema-microsporidia:-friend-foe-and-intriguing-creatures. The work of the Managed Pollinator CAP program is designed to provide feedback to queen producers to allow them to adjust their methods of controlling Nosema disease. The researchers are finding that Nosema infections increase the effect of viral infections in honey bees. The current method of detecting Nosema is by counting spores in the mid-gut of foragers. 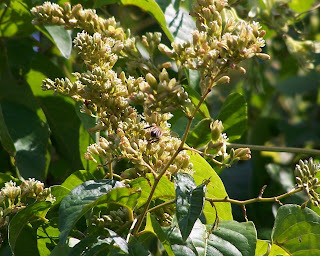 Honey bees are working buckwheat vine today. The tough vine which covers small trees and invades row crops is a heavy producer of nectar in the summer. Buckwheat vine is also known as “ladies’ eardrops” because of the shape of the seed pods produced after the flowers are pollinated by bees. A beekeeping friend in New England started packages of bees in April and May. While each colony had plenty of bees, one colony struggled. These bees took up less syrup than the other similar colonies. Eventually, they quit feeding on syrup altogether. The beekeeper requeened the colony to give it a queen with stronger pheromones and greater egg-laying potential. Still, the colony dwindled and died. A Mississippi beekeeper installed four packages of bees and captured a swarm in May. Each colony started to expand rapidly, and then they all became queenless. A Tennessee beekeeper says that he has plenty of bees in his hives, but they are not putting a surplus of honey in his supers. All three are frequently seen occurrences in beekeeping. It is possible that each shares one thing in common: the new strain of Nosema disease, Nosema ceranae. Unlike the original Nosema strain, N. apis, N. ceranae exhibits no symptoms in the bees. The bees lose their ability to digest food, and they may starve in the presence of plenty food. Like the New England bees, the nutritionally stressed bees quit eating. Nosema disease can lead to early supersedure of queens, a possibility with the Mississippi colonies. Perhaps the most notable effect of honey bee colonies being infected by Nosema ceranae is slow population build-up caused by the premature death of foraging worker bees. While a hive may appear to have plenty of bees, without a large population of the older bees, the foragers, very little surplus honey can be stored. This is a possible explanation for the Tennessee bees’ not storing honey. Nosema ceranae infection produces perforated honey gut linings, exposing the bees to viral infections. The combined effects of Nosema and viruses can be lethal. Randy Oliver discusses current studies into Nosema ceranae on his website, http://scientificbeekeeping.com/nosema-ceranae-kiss-of-death-or-much-ado-about-nothing/. 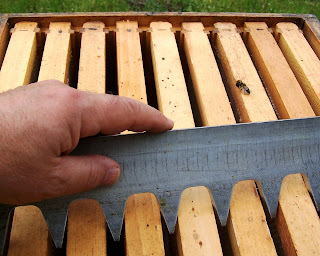 In time for the major summer nectar flows in the Arkansas Delta, I am spacing nine frames so the bees can extend the honeycomb. The Arkansas Delta is an economically depressed agricultural region with a rich heritage located on the most fertile soil in the world. The land produces food and fiber on large farms, models of industrial agriculture. 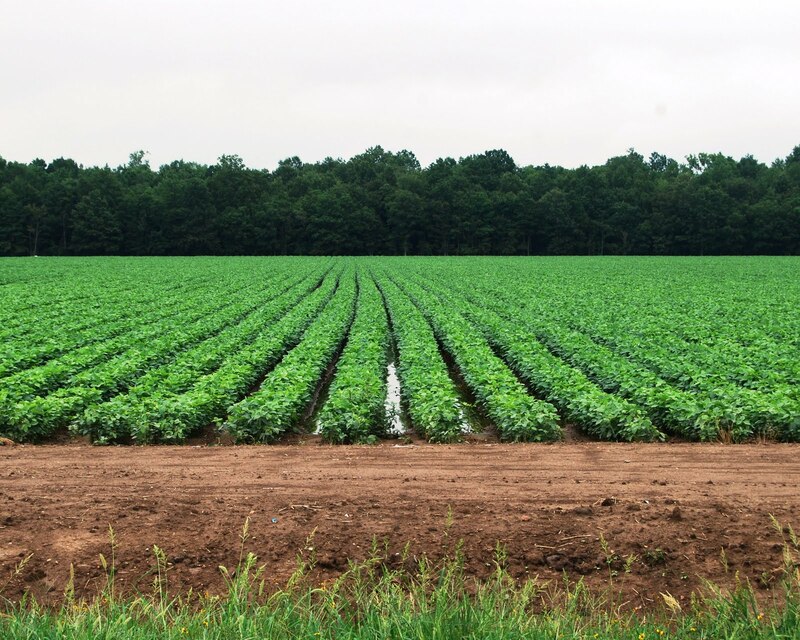 These modern row-crop farms produce soybeans, cotton, rice, corn, wheat, and grain sorghum using a minimum of tillage. Mechanical cultivation of the soil to control grasses and weeds has largely been eliminated by the use of genetically modified crops and herbicides. With agricultural labor needs greatly reduced, employment opportunities in the Delta became scarce. Many of the cities in the region lost population; some resembled ghost towns. Three years ago, a non-profit organization called Arkansas DeltaMade, http://www.arkansasdeltamade.com/, formed to help market goods produced in the 15 Delta counties along the Mississippi River. DeltaMade located artists, craftsmen, potters, woodworkers, cooks, and individuals with numerous skills. Peace Bee Farm was proud to be one of the first businesses selected to carry the DeltaMade logo. The story of DeltaMade was carried on ABC World News. See the story and the short video “Made in America: Marketing the People Behind the Product” at http://abcnews.go.com/Business/made-america-marketing-people-product/story?id=13969196#.Tg0kHZZxEfQ.facebook. Producer Erin Hayes questioned Rita and me along with DeltaMade’s Beth Wiedower about the effectiveness of promoting cottage industries as a means of reviving economic development in the Delta. DeltaMade has created or saved three hundred jobs in the area since its creation. We also pointed to the work in Appalachia by the Coal Country Beeworks, http://www.eri.eku.edu/honey.php, for creating jobs in the mountains of Eastern Kentucky and West Virginia. Perhaps, the time is right to use home and community-based businesses to support local economies. Many of these would not exist without the assistance and promotion of groups like DeltaMade. 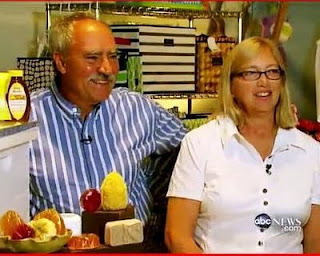 In today’s picture, captured from ABC World News, Rita and I discuss marketing of locally produced products at Helena, Arkansas. We find that the producers take great pride in the region. We appreciate the attention given to those who work to revitalize the Arkansas Delta.